Three former high-ranking officials with New York City’s Department of Correction filed Federal Employment complaints on Wednesday, alleging racial discrimination. Sarah Wallace reports. Three former high-ranking officials with New York City’s Department of Correction filed federal employment complaints on Wednesday, alleging racial discrimination. The three officials — former Senior Deputy Commissioner Charles Daniels, former Deputy Commissioner of Operations Errol Toulon, Jr., and former Asst. Commissioner of Correction Intelligence Keith Taylor — said in their complaints that racism is widespread and rampant in the DOC and that a glass ceiling exists for minorities in upper management. A spokesman for the DOC said it does not comment on specific employment complaints. Charles Daniels, who worked for years in the federal correction system, said he came to New York City in January of this year at the behest of Commissioner Joseph Ponte. “He indicated that the system was a complete disaster, that it was out of control, that inmates ran the system, that there was failed leadership at every level in every position,” Daniels said. He said he found a system in chaos and disarray, with staff fearful of inmates. 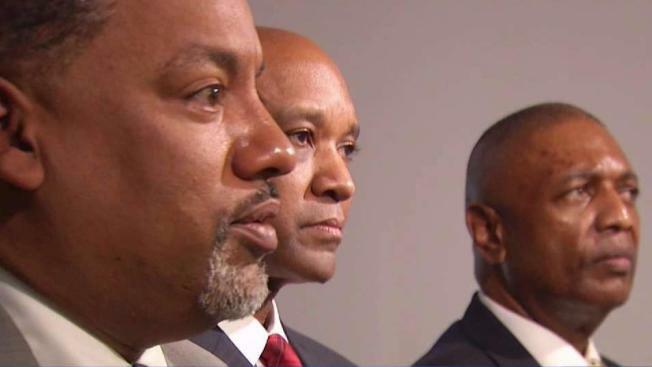 The three claimed the Department is mired in mismanagement and that in response to pressure from City Hall to reduce violence, numbers are manipulated. “The numbers that are reported to the first deputy mayor are, in my opinion, false, and knowingly false,” Daniels said. “All they do is purge that housing unit of the violent inmates, so that violence in that unit goes down and the next week they go back and report it as down. But when you look at the metrics around the agency, you’ll see that the violence actually increases,” he added. Dr. Taylor said crime scene technicians often found that evidence of a crime scene had been cleaned up by the time they arrived. The former officials said they were targeted when they tried to make improvements. Taylor and Toulon said they were forced out in February. Daniels resigned in April. Toulon, whose family worked in the DOC for years, said he was bitter. “It’s a sorry state that in this city that declares so much diversity and so much that has been accomplished, that we’re still dealing with issues like this,” he said. Ponte, under scrutiny for misuse of public funds, announced his retirement in May. His last day on the job is June 28.